Bordeaux insider and well-known négociant Bill Blatch (Vintex) has released his detailed view on the much talked-about Bordeaux 2009 vintage. Also, Blatch has recently launched a blog, Bordeaux Gold, and there you can request his "Vintage Report". Needless to say, the name of the blog refers to the golden wines of Sauternes & Barsac, and Blatch' preliminary attention is geared towards these sweet wines. That's a good thing, because in general these beauties deserve more attention (in January 2008 I attended an inspiring Sauternes tasting with Blatch). A decade with no off-vintages – Bordeaux has never experienced that before - even those all-time great decades, the 1920s and the 1840s had a few misses. In this first decade of the new millennium, all have been successful, four made by end-of-season sunshine (2001-02-07-08), two by heat early in the season (04-06), and four of highly concentrated wines from a combination of good summers as well as good autumns (00-03-05-and now 09, each receiving more acclaim than the previous one). That is a total all-time record. And this final one has turned out to be the most concentrated of them all. In 2009, we seem to have reached the extreme limit of Bordeaux concentration Yet it was not the hottest year by any means – that was 2003 – nor was it the driest – that was 2005. In 2009, there were no extremes, just good regular heat at the right times, with everything coming in the right order: the vine amply nourished by ground water during its growing period, then, as from 15th June, starved of water – very progressively - during the ripening and concentration of its bunches right through the rest of the vineyard year. I can't wait to taste the 2009's myself (which will happen end of March - beginning of April as I mentioned earlier). 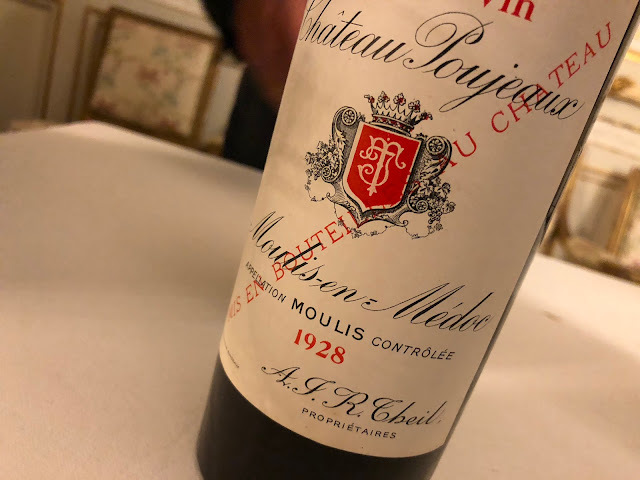 Then for something completely different... the Mouton-Rothschild 1997 that Dwayne wrote about in the previous posting - Jane Anson twittered about this posting "love the understated handover moment", and I fully agree with that. It is this kind of selfless spontaneous energy between people that makes life beautiful - say the familiar "small things". This energy continued its flow into my, and Jan van Roekel's, direction, as Dwayne kindly invited us to share this special bottle with us. Let's start with my conclusion: I found this Grand Vin extremely quaffable, and I don't mean that as an insult. It was so attractive and supple that I found it difficult to sip and taste in a restrained manner, as one might be supposed to do when drinking a premier grand cru classé. So how would I describe this Pauillac: the nose reveals a mature Bordeaux, with a hint of blood (iodine), wet forest floor and old leather. In the mouth the Mouton comes across soft, mouth-filling and intense. Refined and delicious. The wine is elegant yet quite masculine with dark blackberry fruit. Lovely purple-sweet it is, soft and gripping. A delicious wine and very much à point right now. If you still own 1997s, I would suggest bring these out of your cellar! Note that you can also find (most of) Bill Blatch's Bordeaux 2009 Vintage Report on the website of Jancis Robinson. How about adding Sauternes and Barsac to Bordoverview for 2009? Hard work I know but I'm sure Bill and I could help you with prices if needed.